Not only is Mount Etna Europe’s largest active volcano (3,329 m (10,922 ft) high), it is also one of the world’s volcano experiencing the longest most continuous eruption. Mount Etna is an active stratovolcano located near the eastern coast of Sicily, Italy. The volcano has been erupting for the past 500,000 years and is one of the most studied volcanos in the world. 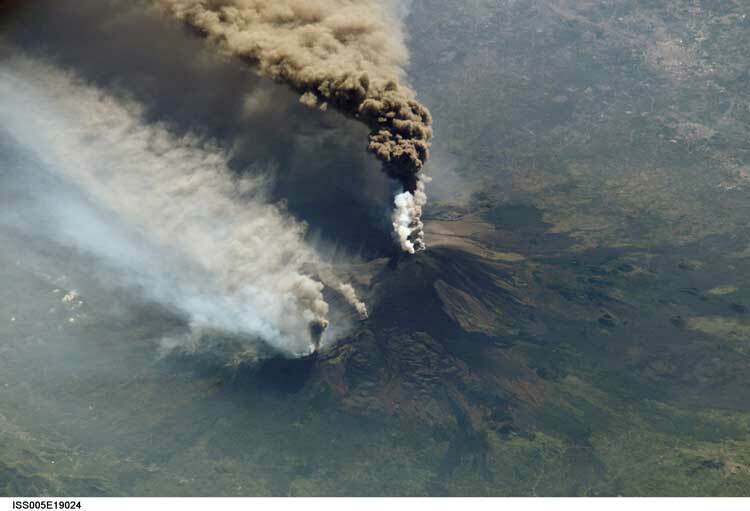 The eruptions are so dramatic, they are visible from space. This image of Mount Etna erupting was taken from the International Space Station (ISS) by Commander Leroy Chiao of Expedition 10 on October 30, 2002. A series of earthquakes in Italy on October 27, 2002 triggered eruptions from the volcano. The image shows higher altitude winds carrying the ash plume south toward Africa. Ash from the eruption was reported in Libya, 350 miles away. Mt. Enta erupting on October 30, 2002. Photo: Commander Leroy Chiao of Expedition 10, ISS. More recently, the Copernicus Sentinel-2A satellite captured Mt. Etna erupting on March 16, 2017. In the image, the red hot lava flowing from the volcano is clearly visible. The image has been processed and the snow cover Mt. Etna has been colored blue to distinguish it from clouds. Mt. Etna eruption. Image: modified Copernicus Sentinel data (2017), processed by ESA. Radar interferometry on the European Space Agency’s ERS-1 and ERS-2 satellites can detect ground movement to the millimeter. 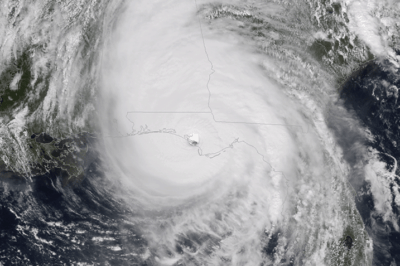 Using remote sensing technique called ‘persistent scatterer interferometry’, data collected from the satellites was processed to measure changes in height over time. Researchers at the Jet Propulsion Laboratory (JPL) developed an animation of Mt. 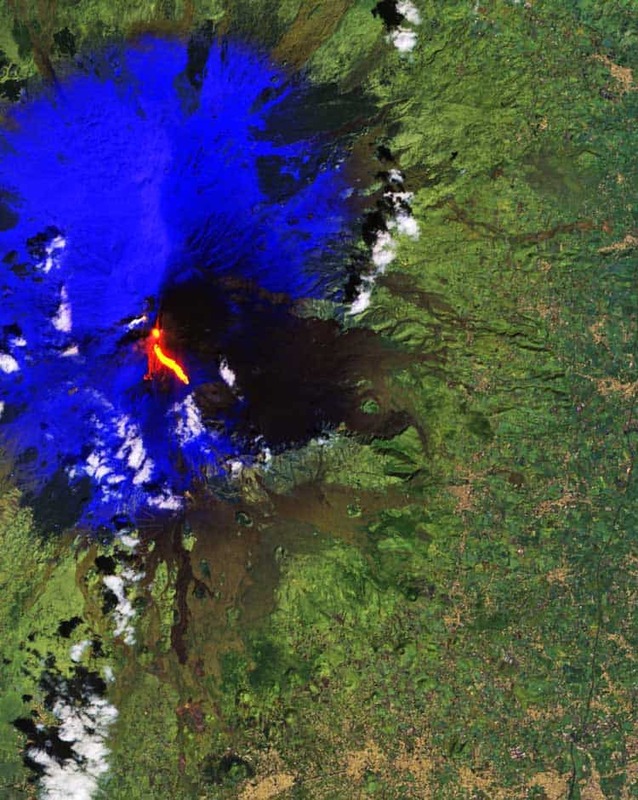 Etna using this data. The animation shows ground deformation for the volcano between 1992 and 2001. Yellow (moderate activity) and red (strong activity) indicated periods of eruptions. The colored bars on the timeline as the animation progresses also highlight periods of eruptions. Reference: Lundgren, P., and others (2004), Gravity and magma induced spreading of Mount Etna volcano revealed by satellite radar interferometry, Geophys. Res. Lett., 31, L04602, doi:10.1029/2003GL018736.